This is a personal account mostly dredged out of memory and is thus full of holes. One forgets names and events, muddle dates, reconstruct events, and even take up someone else’s story as one’s own. However, this kind of narrative is easily corrected by others and it helps to fill out and enliven official documented material that often has very little to say about our day-to-day lives. When my parents, Tom and Amy Halcrow, moved to Birkenhead with my brother Dexter early in 1940, my sister Dawn and I remained in Hamilton boarding with friends until the others were settled. Eventually, we boarded the Limited Express at Frankton bound for Auckland where Dad met us at the station and guided us to the ferry wharf. At first, it seemed that instead of a city, we were off to the countryside because all we could see of Birkenhead consisted of steep cliffs and hills covered in pine trees and bush, However, once ashore and driving up the road, we found that we were not to live in the depths of a forest after all, but in a perfectly normal suburb. 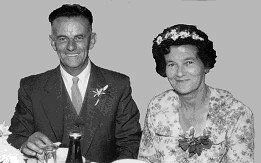 Dad and Mum had married in Hamilton in 1921 and soon had two children, Dawn and Dexter. A prosperous future seemed assured when they were left a small dairy farm near Frankton Junction by an elderly bachelor family friend. However, it turned out that the farm was encumbered by debt. As butterfat prices declined during the Slump the mortgage could not be serviced, the mortgagors foreclosed, and Dad and Mum lost everything - farm house, land, herd, implements and were left only with their personal belongings and the two children. I was born a year or so later. It took years for the family to recover. While they were helped by Mum’s parents and brothers who kept a fine vegetable garden, Dad went from door to door doing odd jobs, and sometimes managed to get pick and shovel work on the roads. Mum made and mended at home and knitted for an exclusive babywear shop in Hamilton. Eventually, Dad secured work with Lands and Survey at Galatea around 1934, and then at Reporoa where he worked as overseer of two large estates, which were being broken up into smaller rehab dairy farms for returned servicemen from the Great War. At Reporoa, a dozen or so relief workers were employed under Dad’s supervision while Mum cooked for us all, including the single men. By 1937 Mum and Dad had saved enough to invest in the ‘Hospital Kiosk’ opposite the Waikato Hospital. This little shop stocked newspapers, magazines, lollies and comforts for the hospital patients, and Mum served morning and afternoon teas to their visitors. It is still there and not much changed from the late 1930s. Several years’ later, Dad and Mum decided to move to Auckland, looked at several possible shops and eventually decided on the little grocer’s shop at 24 Mokoia Rd previously owned by the Walker Brothers. Our new home was a workers’ cottage next to the shop, sited near where the TAB is now and some distance from the other shops at Highbury. The cottage looked rather like those in the old Chelsea Village (Anon., 2002) and perhaps it was one that had been relocated. Certainly, it was old and in very poor order with sloping floors and the timber riddled with borer. Two or three paces from the front gate you climbed several steps to a narrow veranda. The front door led into a narrow corridor with a bedroom on each side. Mum and Dad slept in the room on the left, while Dawn and I shared a double bed in the other. Privacy from the public footpath outside was provided by Camellia trees planted exactly outside the two bedroom windows. The corridor opened into the sitting room, which contained a small iron fireplace. What had been a side bedroom was now a storeroom where you had to be very careful indeed with your feet in case you fell through the rotting floorboards. A large lean-to at the back of the house made a kitchen and dining area, with a small space screened off to make Dexter’s bedroom. The kitchen facilities were limited to an old gas stove, a small bench with a sink, a cold water tap and a few shelves below for pots and pans, and a dresser for our crockery. The back veranda, with its superb view across the harbour, ran across the width of the house, with half of it walled in to make an after-thought bathroom. This was furnished with a galvanised iron bathtub, no hand basin, and a terrifying gas Califont that started up with several explosions, roared, rumbled and shook, and delivered a miserable trickle to give a few inches of warm bath water. I had only a weekly bath when I was issued with a fresh set of underclothes (the ‘change daily girl’ appeared only after the war ended). Hair washing was also a weekly event requiring kettles of water to be heated on the stove and poured into an enamel basin. A night-time visit to the toilet was fraught with terror because one had to negotiate the back steps in the blackout and follow the path beside the wash-house and around the side. Not only that, there was always the nightmarish possibility of being caught sitting there when the night-man came around to empty the can. Not that I ever did clap eyes on him. The wash-house contained a copper, a pair of kauri tubs, and a large, wooden wringer. However, unlike many of our neighbours, Mum declined to fire up the copper every Monday morning and sent the sheets, towels and our white cotton interlock undies to the ‘bagwash’ for laundering. The damp washing was returned for us to hang out on a prop clothesline that was inclined to collapse and drop everything onto the wet grass below. Behind the house a row of sheds contained a garage and storerooms for grain, pollard and bran for our customers’ chooks, and further back was a row of old fowl houses. One of these later became the site of our slit trench air-raid shelter with the great advantage of protection from the rain and we did not have the prospect of having to swim about in muddy water and duck dive every time the Japanese made a bombing run over the city. In spite of our primitive washing and sanitation facilities and our plain diet of meat, spuds, vegetables and pudding, I cannot remember any of us having head lice or scabies or being pudgily unfit. Generally, our health was surprisingly good, except for the regular rounds of ‘summer sickness’ and winter infections of our adenoids and tonsils. Although vaccinations for diphtheria and whooping cough were available, TB and polio remained our major health fears. Unlike our parents and older brothers and sisters, we small children suffered very little during the war unless a family member was lost. Lollies, chocolates and oranges became rare treats and we were soon deprived of Guy Fawkes’ night because, apart from breaking blackout rules, there was no gunpowder to spare for crackers and toy rockets. However, we had other excitements. Comics, magazines like Champion (remember Rockfist Rogan?) and the Saturday night movies provided an endless source of war themes that could be played out in the long summer evenings. Depending on our mood, we girls could always choose between war and peace and opt to play ‘house’ instead – or hopscotch or skipping or tree climbing. Every now and then we embarked on some kind of fund-raising venture (for the Patriotic Fund Board, I suppose), and at school, we often put on lunch-time concerts with ourselves as the stars, entry a penny, or else set up ‘penny trails’. The little calico bags we all wore round our necks reminded us that the war was serious because they each contained a cork we were supposed to bite on when the bombs dropped so as not to have our eardrums burst. However, air-raid drills at school were good entertainment, while the best fun was had when practicing how to get home cross-country. Acting as casualties during air raid practises was also good value for entertainment. Later, we watched American soldiers as they trucked cordite-filled shells down Mokoia Road from Kauri Point to Devonport. By then, I was getting old enough to be conscious of those gorgeous young men but, sigh, still not old enough to be noticed by any of them. Life was less amusing for my sister Dawn. With so many youngmen away in the forces young women often found that their weekends were dull and boring so that indeed, Saturday night was ‘the loneliest night of the week’. The shop was a typical general grocery shop about 15ft wide and 20ft deep and not much different from others of its kind. The recessed shop door was centred between the two large front windows. The walls had been removed from the old-fashioned front showcases, which improved day lighting in the shop and permitted us to see out to the road. Inside, the space was dominated by the main counter which occupied most of the left hand side. On it were placed the till, the scales, docket books, and small counter displays. Behind the counter a row of large wooden bins contained bulk dry goods like flour, sugar, brown sugar, oatmeal and rice, each with its own scoop. Above the bulk bins was a row of neat little drawers containing herbs and spices which had to be carefully measured out with tiny scoops in half ounce lots into dainty little white paper bags. 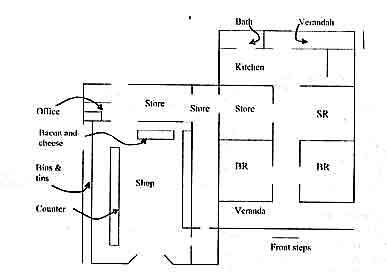 Plan of house and shop at what was 24 Mokoia Rd. about where the TAB is now. I know of no photograph of the shop. Photographic films were expensive and in very short supply during the war, and many of our family photographs were lost during a household move. Apart from tinned and bottled goods most groceries arrived from the warehouses in bulk lots. Some tea, such as ‘Roma, the dust free tea’ was packaged but we also received loose tea in large wooden tea chests lined with tin-foil. Coffee came only in square bottles of coffee and chicory essence, or coffee and milk. Loose biscuits were packed in those famous Bycrofts tins (with a picture of a running boy carrying a Bycroft’s tin with a picture of a running boy…) and were weighed out in eight ounce (half pound) lots in brown paper bags. Broken biscuits were never thrown out but sold at a cheap rate to pensioners and children. Rice was strictly for milk puddings, and unheard of as a vegetable. Bacon and cheese were kept separately in covered counters at the rear of the store where we cut slices one-by-one from a whole side of bacon with a hand-driven rotary cutter, always trying to make the slices nicely even. The large rounds of cheddar cheese (mild, medium and tasty) were cut into wedges using a tightly stretched length of piano wire. There, the aim was to cut the piece of cheese as close as possible to the ordered weight. Butter was kept in an icebox cooled by a large block of ice that was delivered once a week. Most of our goods came from warehouses in the city, but in the earliest days, some women would bring farm eggs for sale and dear little half-pound pats of farm butter complete with a scotch thistle stamped on top. One of Dawn’s tasks was to grade the farm eggs by weighing each one on tiny egg scales so she could calculate what to pay for them. Once a week, Dad queued up for the vehicular ferry to go to the markets in town to buy vegetables and fruit. Apples and oranges were especially welcome because they came individually wrapped in coloured tissue paper and neatly packed in wooden cases. Every sheet of tissue paper was retrieved, smoothed out, stacked and tied onto a string loop to be hung in the toilet. Like so many other goods, toilet paper was expensive and often in short supply, so that when we ran out of those pleasantly soft tissue squares we had to resort to scratchy newspaper squares on a string loop. Next to the main shop a long narrow connecting room had been built between the shop and the house. Most of the space was used as a storeroom, but the front area was sometimes used for retail. The little office behind the shop was equipped with a wall telephone and a sloping desk where you stood while making up accounts and for writing lists of groceries when customers phoned in their orders. The rest of the back room was given over to a general work space and more storage. As most shop workers know, during a slack period you would make tea and just as it was ready to drink, in would come customer after customer until the tea was completely cold. Although we delivered groceries far and wide around the district, many women who lived nearby walked to the shops several days a week, all properly outfitted with dress, coat, hat, gloves and stockings. Many shoppers simply came to hand over their grocery orders to be delivered; otherwise they could buy only what they could carry, and being mostly without cars or refrigerators, had to buy perishable goods only in small amounts. In those days, grocer’s assistants required a fair amount of time and energy. A customer would come to the counter, take out her shopping list and read off the items one-by-one. The assistant then ran to fetch each item from here and there round the shop and weigh it out as it was asked for. Among our customers were several women from the north of England who had matured into formidable shoppers. With their strong northern accents (think of Ena Sharples), it was very hard to understand them when they were giving their orders, especially when they became a bit excited. I was especially fearful of one redoubtable lady who quickly lost patience with me and would speak more and more loudly to make me comprehend until when it came time to tot up her order while she stood over me I was quite demoralised and ready to cry. It was an enormous relief when we got a till with an adding machine, but in any case I always tried to hide when I saw her coming down the road and hoped someone else would serve her. The whole family worked in the shop at some time or other. The school leaving age was then 14 and both Dawn and Dexter were taken from school to work in the shop and for some time were paid just a few shillings pocket money each week. Because Dad belonged to the old cow-cocky school of thought that regarded children as cheap labour, none of us ever received the award wage. For the first few years, Dawn worked in the shop while Dexter drove the little van and delivered boxes of groceries right to customers’ kitchen tables. After a couple of years, Dawn was allowed to get a clerical job at the Railways Inwards Goods office in the city taking the place of a young man who had joined up, but at about two-thirds his wage. Dawn was replaced in the shop for a short time by a young, red-headed school leaver, Wilfred Dil. Wilf was great fun with a wacky sense of humour. Along with Dexter he joined the Home Guard and the volunteer fire brigade. Later, Wilf founded Dil’s Funeral Services and the business can still count us among their loyal customers. Wilf was succeeded by Lemuel Ollard who remained with the business for some years. Dexter was called up into the Air Force, but the war ended before he was sent away. Later, he established his own business, North Shore Concrete Products, where he was joined by Chris Paltridge. At first, I didn’t work much behind the counter because I was still at school, but during weekends I was often kept well-occupied pre-packaging fast-moving, basic goods – never mind if all the other children were off to the beach. Dad had some American grocers’ manuals which advised their readers that pre-packaging meant that customers did not have to wait so long while we weighed out each item, and that we could serve more customers more quickly. Much of the weighing-up and packing was done during quiet times in the shop or else during evenings and weekends. The most important task was to fill brown paper bags with three pound lots of flour scooped out of Northern Roller Mills flour sacks, or six pound lots of sugar out of hessian sugar bags from the sugar works. When each paper bag was correctly filled and weighed, the top was folded several times over a length of string drawn from a cob hanging from the ceiling. The two ends were folded together and the string was tied and snapped off – but not by me, I always had to cut the string. The stickiest job was making up one pound and half pound bags of dates or sultanas when little bits of stickiness ended up all over me and it seemed as though I stuck to everything. However, the most hideous assignment of all was weighing up six pound lots of potatoes. Having my finger tips and nails touch the dry dusty skins made my back quiver and crawl just as when chalk slips on a school blackboard. It was always much more interesting to make up orders and pack them into cardboard boxes to be delivered all round the district. Occasionally, I’d be allowed to accompany Dexter on his rounds past orchards, market gardens, scrublands and little dairy farms to seemingly remote farm houses on Stanley Rd and Manuka Rd. There were pleasures and traps built into all these accessible gastronomic treasures. One Sunday when all the adults were out, Jackie McCarthy from across the road and I tried sampling as many different foods as we could from sweet biscuits to icing sugar to the delicious lumps among the brown sugar, as well as fragments of cheese, followed by dates and sultanas. By the time we decided to complete our foodie explorations at Jackie’s place we were both very full, and on sampling a little pickled onion, I threw up. Even now, the smell of pickled onions reminds me of that wicked day. Birkenhead was then a mixture of suburban and rural life. Families raised much of their own food and supplied fruit and vegetables to the city markets. I was sometimes sent down to the shed to weigh up bags of wheat, maize or pollard for our customers’ chooks. Although most of us kept hens in the backyard, a poultry dinner was a special treat for Christmas or a birthday because it was much too expensive to even think of killing off a laying hen from your little flock. A common custom was to select a handsome young rooster and after some months of carefully favouring him with lots of tasty tidbits, he would be decapitated and eaten. Turkey dinners were never a tradition in New Zealand except where wild turkeys wandered on a farm. In our family, the traditional Christmas dinner consisted of spring lamb, roast potatoes, boiled new potatoes, new green peas from the garden and mint sauce made with our own mint and DYC malt vinegar. Because this part of the Shore was then somewhat isolated from Takapuna, Devonport and from Auckland, some of the locals were inclined to be a bit parochial. As soon as Tom and Amy took over what had long been the Walker Brothers’ shop, many customers promptly left. After all, they had a choice of six other little family groceries around Birkenhead. Turnover dropped, and wartime short supplies and rationing were on the way. Grocery margins were always very small so that once more, Mum and Dad had a worrying time making the shop earn a living. For the next couple of years, Dad, Mum, Dawn and Dexter worked hard at rebuilding the business, but at the same time they took a full part in local activities. All I did was go to school, learn to swim at Birkenhead beach, fish for sprats off the Chelsea wharf, be fairly respectful to the grown-ups and attend Madame Mayall’s after-school dancing classes. Mum bravely became my personal wardrobe mistress and worked out how to sew my costumes … not for a fairy or a swan queen, but for a soldier and of all things, a spotty dog, for our end-of-year recitals. Then one day, Dad came home and announced that he had bought the fine old house and section right on Highbury corner, with just half-a-crown deposit. Reference: Anon. (2002), Chelsea Village (reprint of article in Birkenhead Gazette, 1927), Birkenhead Historical Society Inc Newsletter, (September 2004), p.2.